Robin Youngs, Edward Fisher,	The Journal of Laryngology & Otology, Volume 129 Issue 9, p 825. A T Harris, S Derbyshire, J Wilson, C Loh, A J Kinshuck, B Attlmayr, T M Jones,	The Journal of Laryngology & Otology, Volume 129 Issue 9, pp 826-830. G H Jones, R Murphy, S Agrawal, M G Isles,	The Journal of Laryngology & Otology, Volume 129 Issue 9, pp 831-834. J Joseph, A Miles, S Ifeacho, N Patel, A Shaida, D Gatland, G Watters, E Kiverniti,	The Journal of Laryngology & Otology, Volume 129 Issue 9, pp 835-839. J W Lee, P Sale, N P Patel,	The Journal of Laryngology & Otology, Volume 129 Issue 9, pp 840-851. Can computed tomography and magnetic resonance imaging differentiate between malignant pathology and osteomyelitis in the central skull base? F D Lesser, S G Derbyshire, H Lewis-Jones,	The Journal of Laryngology & Otology, Volume 129 Issue 9, pp 852-859. J S Phillips, M W Yung, I Nunney,	The Journal of Laryngology & Otology, Volume 129 Issue 9, pp 860-864. D G Ioannidis, V A Lachanas, Z Florou, J G Bizakis, E Petinaki, C E Skoulakis,	The Journal of Laryngology & Otology, Volume 129 Issue 9, pp 865-869. C R Kieliszak, T R Khoury, A Singh, A S Joshi,	The Journal of Laryngology & Otology, Volume 129 Issue 9, pp 870-873. Pulse oximetry in paediatric obstructive sleep apnoea: is it used appropriately? H Kanona, S Sharma, K Chaidas, B Kotecha,	The Journal of Laryngology & Otology, Volume 129 Issue 9, pp 874-881. M M C Yaneza, H P James, P Davies, S Harrison, L McAlorum, W A Clement, H Kubba,	The Journal of Laryngology & Otology, Volume 129 Issue 9, pp 882-886. A Yenigun, H Karamanli,	The Journal of Laryngology & Otology, Volume 129 Issue 9, pp 887-892. G S Bethell, P Leftwick,	The Journal of Laryngology & Otology, Volume 129 Issue 9, pp 893-897. S P Williams, A J Kinshuck, C Williams, R Dwivedi, H Wieshmann, T M Jones,	The Journal of Laryngology & Otology, Volume 129 Issue 9, pp 898-902. P Gorphe, P Blanchard, I Breuskin, S Temam, Y Tao, F Janot,	The Journal of Laryngology & Otology, Volume 129 Issue 9, pp 903-909. Muhammad Shahid Iqbal, V Paleri, J Moor, W Dobrowsky, C Kelly, J Kovarik,	The Journal of Laryngology & Otology, Volume 129 Issue 9, pp 910-915. K S Orhan, B Polat, N Enver, Y Güldiken,	The Journal of Laryngology & Otology, Volume 129 Issue 9, pp 916-918. A A Alsanosi,	The Journal of Laryngology & Otology, Volume 129 Issue 9, pp 919-922. A M Hassan, R Patel, M Redleaf,	The Journal of Laryngology & Otology, Volume 129 Issue 9, pp 923-927. 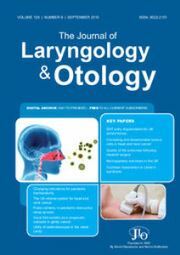 S H Tan, N Prepageran,	The Journal of Laryngology & Otology, Volume 129 Issue 9, pp 928-931. F M Egro, S Sharma, D Baldwin,	The Journal of Laryngology & Otology, Volume 129 Issue 9, pp 932-934.